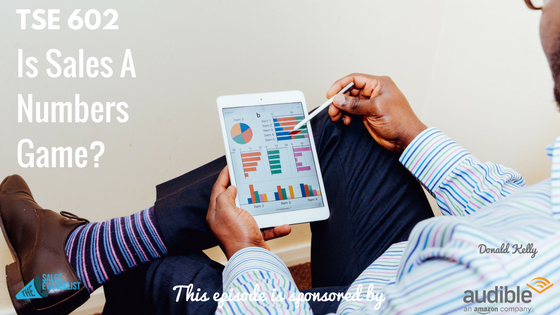 TSE 602: Is Sales A Numbers Game? Home » TSE Podcast Post Page » TSE 602: Is Sales A Numbers Game? Do you think sales is purely a numbers game? You’ve probably heard of sales teams or have been part of a sales team where they relate sales purely to the activities you do. But does the x number of activities automatically equate with sales? Personally, I disagree that it’s purely just a numbers game. I think it’s a hybrid. If you have individuals going out there and just doing whatever they want regardless of what they do as long as they’re doing activities, you’re just going to get vanity numbers and results that don’t match up. The biggest issue that I find with this concept of having salespeople doing activities and they’ll get results is that if you don’t have the focus on the right target, you’re not going to see results. Know who you’re selling to. Know who you’re going after. You can’t just go out and get as many business cards as you can thinking you can put all those contacts into your email marketing system, send them emails, and they’re going to buy from you. Fatal mistake! As long as you take shots on goals and the more you take shots on goals, the more chances you have of scoring. In that situation, the number is a numbers game and you have to do stuff. But do stuff that’s going to produce results. You can’t just send people out and expect them to come back and bring in money when they’re not going after the right people. Figure out even how to coach your sellers at least once a month, otherwise get someone else to come in and coach your sales team. There are lots of sales coaches out there. Maybe there’s someone in your team that can coach. Train them and get them to coach and help other sellers to get to the top performing level. They will feel less motivated. So is sales just a numbers game? Yes, but only if your sales teams know who to go after, if they know what to say, and if they have a proven process to generate results. Stay busy. Get out there. Pick up the phone. Talk to people. Utilize your network. Focus on the things that matter the most and that are the most effective to your business. We’d love for you to join the TSE Hustler’s League. This is a 12-week semester where each semester, we focus on a theme and each week, we focus on a concept relative to that theme. This semester is focused on how to help you become more buyer-centric and increase your win rate of opportunities.